No more waiting at home for hours for the postman to arrive. Collect your parcel anytime anywhere at your convenience. What do you mean by “works with any online store in the world”? 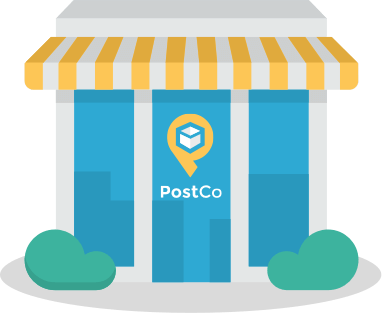 PostCo is another mailing address that you can use for all your deliveries. Collect any of your parcels from online stores like Lazada, Amazon or even your favourite Instagram store! Can my friend collect the parcel on behalf of me? Yes, you can! Just pass him or her the Collection Code that we’ve generated for you. What does Unlimited plan mean? With one flat price, you can send as many parcels/documents over to any of our locations. Just remember to make a booking for each incoming parcel/document beforehand. I do not own a credit or debit card. Do you allow any other payment methods? Don’t worry, just reach out to us on our chat support for further details. What happens after the 14 days storage period? Let us know if you have an emergency or if you are unable to collect your parcel within that timeframe, we will try our best to accommodate! If not, the parcel will be sent back to our office. Is this service free to try? Yes, on any plan that you choose - you get to collect your first parcel for free! Will the store know if I’m sending my parcel over? Any size or weight restriction on the parcels? We allow parcels up to 50cm x 50cm x 50cm and maximum 20kg. Want to learn more about PostCo? You just need to sign up and start shopping online! Delivery within 1 to 3 working days.